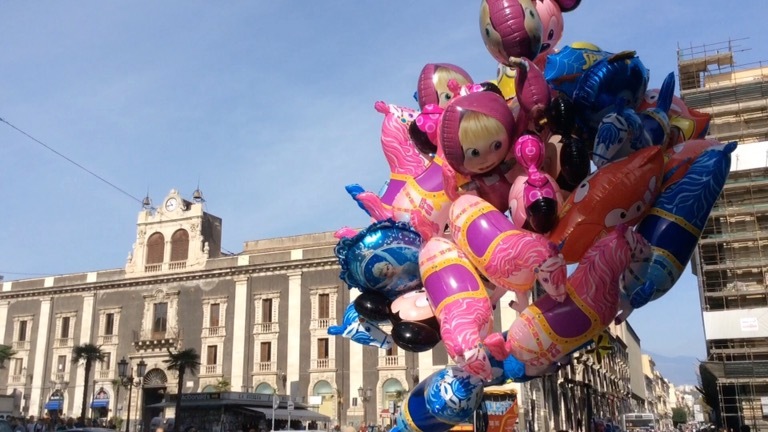 48 Hours in Catania. 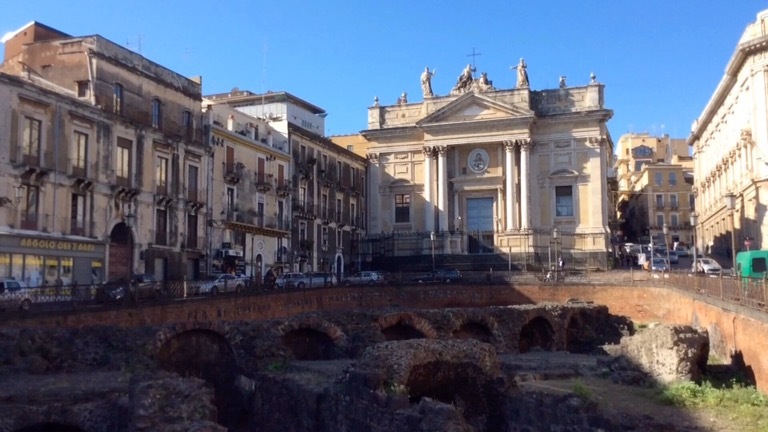 Sicily.We have just returned after a wonderful couple of days in Catania, the largest city after Palermo in Sicily. We thought we would take advantage of the great low fares offered by Ryanair from our local airport, Perugia. Our flight from Perugia cost around €70 return for the two of us. It took just over one hour. I like flying but I am NOT a lover of airports ! The exception being Perugia!! To me the airport experience is usually tedious, stressful, expensive and pretty boring. Long queues. Expensive refreshments. Expensive parking. Stressful check-ins. Long distances to walk (or offen run!) ) Often not-very-helpful staff, Etc etc etc. Flying from Perugia is GREAT! The airport is small and cosy. It’s like going home! Everyone remembers you. The staff, including the bar, customs, police, car hire, everyone …are friendly, helpful, accommodating. The appropriate word probably is HUMAN! I’ve yet to find an airport like this anywhere else ! Arent we lucky to live just thirty minutes away!! Above: We loved the area around Piazza Duomo. It was so full of life and character and culture. The flight to Catania took just over one hour and yet the Ryanair staff somehow managed to deliver their usual drinks and food and duty-free and scratch cards looking their usual smiley and stress free selves despite passengers finding it difficult to get organised! It was a late flight arriving in Catania about 9pm. We had booked (with Ryanair) the bus … Alibus …to Piazza Stesicoro and that worked very smoothly. The driver was great and told us when our stop was coming up. It was a twenty minute transfer. Above …our GREAT B&B ! Getting off the bus, was, I must admit a bit of a culture shock! Coming from quiet, clean and peaceful Umbria to Sicily is well, WOW! Especially when arriving after dark. Maybe arriving from Liverpool or London or Milan would be kinder! It’s the noise and cars and litter and people and a feeling of ‘…are we safe here!’ But our concerns soon vanished . We were safe and everyone was very friendly and helpful and only too eager to help us find our B&B. 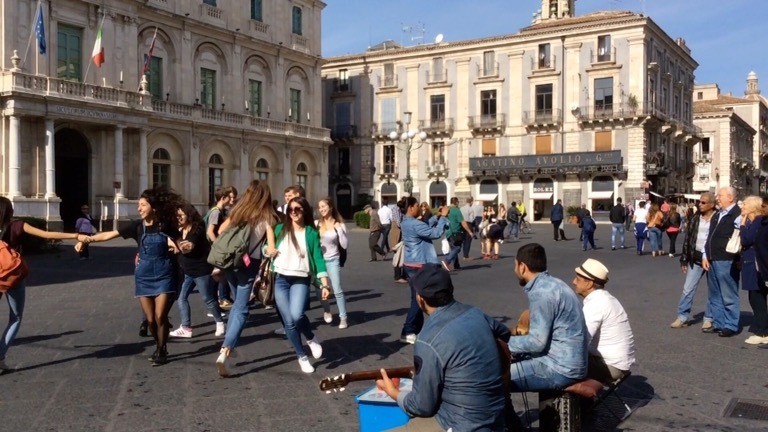 In fact the people of Catania are really adorable ! It was difficult to tear ourselves away from bars and restaurants and the B&B because we just wanted to stay and chat! We chose B&B Stesicoro because it had such good reviews and because it was so central. We were NOT disappointed! Don’t be put off by the entrance down a short dark alleyway. It’s fine. The actual B&B fronts onto the piazza and it’s great fun before breakfast watching the marketeers set up every morning. View of B&B Stesicoro Via Etnea is one of the busiest and most popular streets in the city, cluttered with shops and restaurants and bars. It leads to the Duomo and castle and market plus you can always see Etna! Unfortunately, because of the clouds I never got to take a good photo of this majestic volcano which towers over Catania and, according to locals remains active, erupting every summer for a week or so. 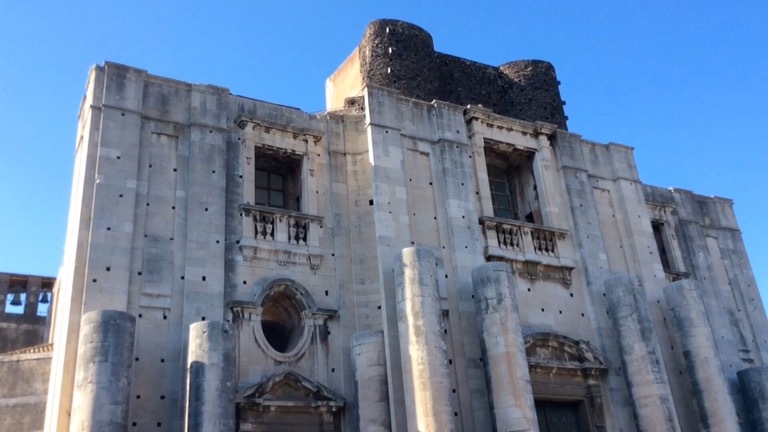 Right outside the B&B is the Piazza Stesicoro complete with the ruins of an amphitheatre and some of the most magnificent examples of Baroque architecture you will see anywhere. Just five minutes away is a lovely green park . An oasis. Somewhere for people like me who really NEED a green break every day! The Rooms and the location and the people are just amazing. 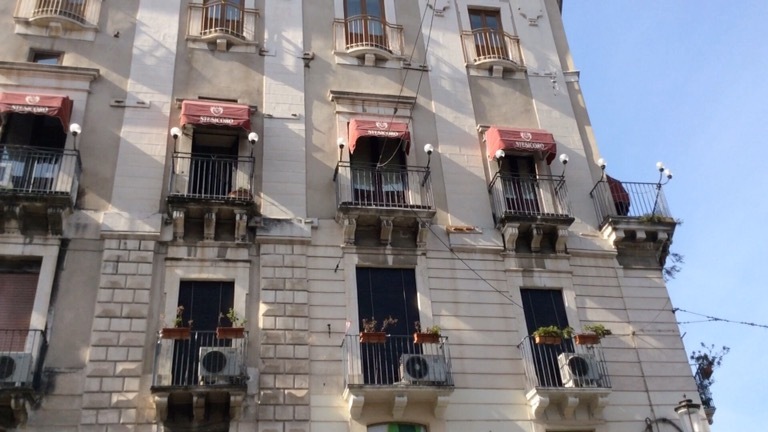 We will definitely go again to Catania and we will definitely stay at this same B&B. The family are so lovely and do everything possible to make your stay a happy one. The rooms are large and very tastefully decorated and furnished. Everywhere is spotless. English is spoken. The air-con and WiFi works well. Breakfast is your typical Italian Prima Colazione with delicious fresh and hot pastries, boiled eggs, ham, cheese, yoghurt, fresh fruits,bread and freshly made coffee. On our first day we had a good wander around the Piazza and the small roads leading from it taking in a few churches ( there are hundreds!) 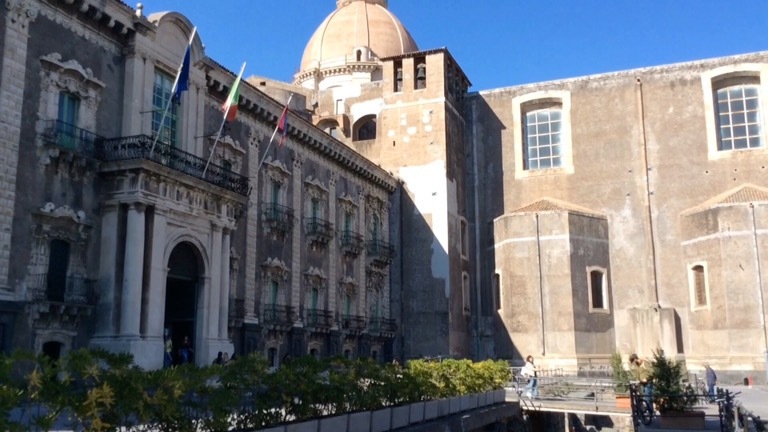 the university and ending up at the church of San Nicolo and the adjoining monestry. San Nicolò (above) is a very strange looking church. The bul dung began in 1702 but was never completed. It is possible to go up the tower where a wonderful clear view of Mount Etna awaits but unfortunately we arrived at the church when it was closed for the afternoon siesta and so missed this attraction. But the adjoining monetary was well worth a visit. The Duomo On our second day we turned right onto Via Etnae and walked for ten minutes past shops and restaurants to the Piazza Duomo. This piazza is spectacular and so are the multitude of little streets leading off it. This area is so interesting and became our favourite. We really loved the huge street market which spreads out from the piazza and is open every day except Sunday. The sights, sounds and smells are incredible! The market From here it’s only a quick walk to the castle and to the Teatro Romano and the docks and so we were able to enjoy all of these in just one afternoon! 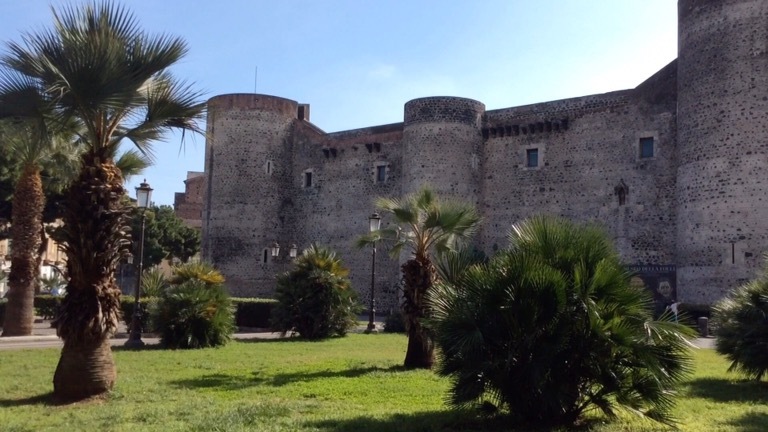 We really enjoyed our two days in Catania but it was not enough! There’s so much more to see not just in the city but in the surrounding area including, of course a visit to Mount Etna. We will definitely go again and, next time, for longer! This is a very short account of our visit. For more I hope you will enjoy the video.